We celebrate and recognise the achievements of family owned Australian businesses, and the special achievers who contribute positively to our lives, our culture and the future of the Australian economy. Our 2018 Award Nominations are now OPEN! The award recognises an individual with a strong entrepreneurial spirit and commitment to the excellence in family business best practice. The recipient demonstrates a `can do’ attitude and is open to family business operators in all generational categories. The Next Generation Achiever Award highlights the role played by emerging family business leaders. It recognises, an outstanding person who is successfully navigating the path to leadership in the family business. The recipient embraces best-practice in the business, and demonstrates commitment to and understanding of, the family values and history. The Award recognises an individual who has contributed to FBA, its members and Family Businesses over an extended period of time. You would have demonstrated significant, sustained and high quality service to family businesses, enhancing the reputation and future of the organisation that they are advising to, along with contributing to the objectives of FBA. The Distinguished Family Business of the Year is the highest family business achievement in recognition of outstanding companies that have successfully blended family and business interests. Chosen from our inductees into the state-wide Family Business Halls of Fame, the award identifies best practice that all family businesses can learn from. The award is announced at the annual FBA National Conference. To view the 2017 inductees up for the 2018 award – click here. 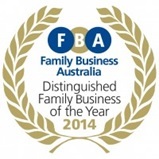 Awarded by the Chairman of Family Business Australia for outstanding contribution. The Chairman’s Award and Life Membership Award recognises an individual’s commitment to the principles of family business best practice and their strong leadership in the development of the organisation’s objectives.